Last night Stuart and I went to see the twentieth-fifth anniversary revival of the wonderfully romantic play Beautiful Thing at the newly opened Above The Stag Theatre in London's glitzy Vauxhall. 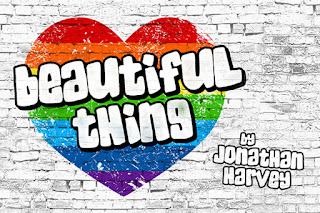 Jonathan Harvey's tale of love blossoming between two teenage boys in a Thamesmead council block still retains all the humour and emotional clarity that it did when the original opened 25 years ago. Ste loves football. Jamie is in love with Ste. Ste gets hit by his Dad. Jamie is at odds with his Mum. But this is a fairy story in every sense so it all comes right in the end. Despite being very familiar with the story it actually made me cry. But it wasn't the love that set me off. It was the domestic violence. So it perhaps goes without saying that I thought the acting was great, the music sublime and the production fitted the small theatre perfectly well. The first half perhaps wasn't quite as good as the second - but after the interval everything seemed to gel just perfectly. Shame about the trains running overhead every few minutes but then to be honest that's probably quite fitting for a South London housing estate! Kyla Frye was great as overbearing mother Sandra. The two male leads, Joshua Asare and Ryan Anderson, were super as the star-crossed lovers Jamie and Ste. Phoebe Vigor was also good as Mama Cass obsessed Leah. And Kieran Mortell played Tony - possibly too handsome - to the distraction of also everything else on stage! We had seats front, centre - so close to the action we could almost get in the bed with them. At its heart a gay fairy tale, 25 years on it's still funny, poignant and has the power to shock and delight.